Marianne Williamson, left, happily poses for a picture with a woman moved by inspirational remarks Williamson made at Parliament of World’s Religions in Salt Lake City. SALT LAKE CITY —With notebook and pen, carrying official satchel stuffed with information and schedules, my assignment is wide open to possibilities during these five days that the Parliament of the World’s Religions is here outside and inside the Salt Palace Convention Center. Workshops have presenters numbering in the hundreds. The official syllabus requires study and careful consideration each day and several times throughout the day to select from the bountiful offerings. Producers of Oprah Winfrey’s “Belief” are here to premiere one of the seven episodes and respond to questions. Ten thousand people from more than 80 countries representing 50 different religious and spiritual traditions registered for the parliament. Yes, from around the globe, they have come. Ours, however, is a walk of just six blocks from where we live near downtown each morning to attend the parliament. My colleague was unperplexed by the voicemail left, never once mentioned how I wanted to beg off coming here because of fear that an unwanted visit from social anxiety would pounce on me from the inside. If you know social anxiety, then you know the burden that comes each time with this visitor that stays for an indeterminate length of time when one second is way too long. Upfront, it is freeing to open about this. Being in the presence of all these women, their collective experiences, bold and provocative voices, women who can, to do and be women, proclaiming in voices that only women can proclaim, there is not even a hint of social anxiety for all of the time spent in the cavernous Salt Palace covering the parliament. “Namaste” greets visitors to my door. It universally acknowledges “I bow to the divine in you.” Spiritual journey began in the LDS Church in our Kearns ward and confluence of The Church headquarters in Salt Lake City. Our genealogy includes pioneers who pulled handcarts across the plains and mountain ranges while on their spiritual quest to get to Utah. Catholicism came with familial changes. Smudging is a practice that we associate with Native Americans and have embraced in our lives for a while now. Buddhism and New Thought continue our journey. In an exhibit hall that one speaker likened to being in an airplane hangar, Marianne Williamson’s words at this Parliament of the World’s Religions rock me to my very soul. Bold and provocative speakers addressed the Inaugural Women’s Assembly on the first day of the parliament. Now, with an expanded roster of speakers, this Friday morning, voices include New Thought Bishop Barbara King of Atlanta, Dr. Vandana, Hindu author and environmental justice activist, Dr. Serene Jones, president of Union Theological Seminary, Ilyasah Shabazz, daughter of Malcolm X and Dr. Betty Shabazz, Mallika Chopra, daughter of Deepak Chopra, and the Indigenous grandmothers. Williamson, spiritual author and lecturer, however, speaks dramatically with a preacher’s calling and sends the “house” into a raucous assembly. “What an extraordinary opportunity to have a Parliament of World’s Religions,” she says, “to have people representing religions from all over the world, throughout our great tapestry of history, here, in order to support each other and to support our common mission. That common mission being to live the lives that we are all called to live at the core of the universality that we all share. “But I also think we have the opportunity being here together to do the work of religion within ourselves,” Williamson says. “And one of the great religious principles is to purify your own heart and atone for your own mistakes. So it is at this year’s Parliament of World’s Religions that women’s voices are given the power and privilege that we have at this great gathering. As women, let us just point out that the history of religion has not been so good to women. And to be honest, even some of the institutionalized religions represented here at the parliament are not doing so good, even today. “So let’s take a moment to turn to our hearts to be honest and to be real,” she says. “When religion refuses to allow itself to honest and to be real it allows itself to merely be co-opted by the very forces that we are here to protect human beings from. That is why many of the female voices are rising today in religious fervor, forming a new vortex of priestesshood. By now, each body in this exhibit hall is standing with some cheering at the top of lungs and clapping enthusiastically. Must confess to never having read any of Marianne Williamson’s books or having heard her speak publically. It is also brought to my attention that she has published eleven books, six of which have been New York Times Best Sellers. Four of her books, it says here, have been #1 New York Times Best Sellers. Williamson’s address at the Parliament of the World’s Religions leaves me in awe of her. Truth be told, her words are among the words here to awaken a new understanding and appreciation of what it means to be a mother, grandmother and woman. My soul filled with joy, my heart with love, and my spirituality is refreshed. We share the same understanding about the roles of all women. In humility, I stand thankful to be a part of the Parliament of the World’s Religions. It is a blessing to see and hear these thoughtful and inspiring women. I come away with a prolonged assignment and that is to reflect and add to my discovery and getting to know these women better. 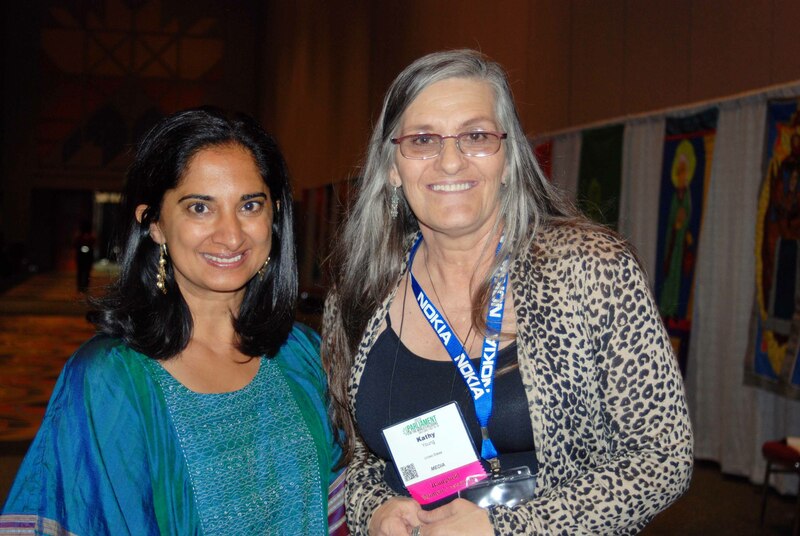 Mallika Chopra, presenter and speaker, is happy to take a picture with Kathryn Ann Young, writer of this column, at Parliament of World’s Religions in Salt Lake City.